OnFILTER’ CleanSweep® AC filters for soldering applications work with virtually all AC-powered professional soldering irons. They are rated up to 3A RMS and from 100VAC to 250VAC depending on the specific model. These filters are small and in obtrusive and require no maintenance. Use of CleanSweep® filters for soldering is very simple: plug your soldering iron through the filter and connect ground of your workbench or board under assembly to ground terminal of filter. 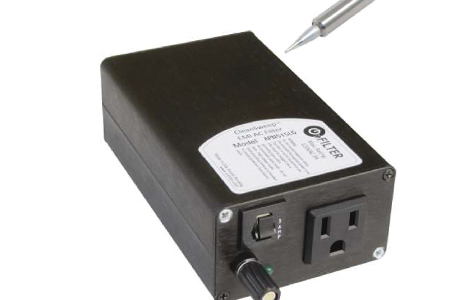 Whether your facility power and ground are “dirty” or your own workbench contains EMI sources, such as microscope light, heat gun and others, CleanSweep AC filters for soldering applications provide noise-free power and ground to your soldering iron and reduce EMI-cause electrical overstress.